The only ALL-IN-ONE VIDEO-MAKING APP (shoot, edit, share) used by beginners, enthusiasts and PROS. Filmakr creates unique folders on Dropbox for each of your films where your footage is backed-up. Even cooler, each new clip gets synced in realtime as you shoot. When you delete a film with one swipe, the large files of your video footage is permanently deleted from your device but remains safe and sound stored in the cloud. A load off your mind. And your phone. Presets save time/hassle by auto-creating each new film with your own beautiful combo of project settings. Save Presets you create by mixing your signature filtered film look with motion effects, title styles and music. Templatize credits/bumper clips as Intros/Outros. 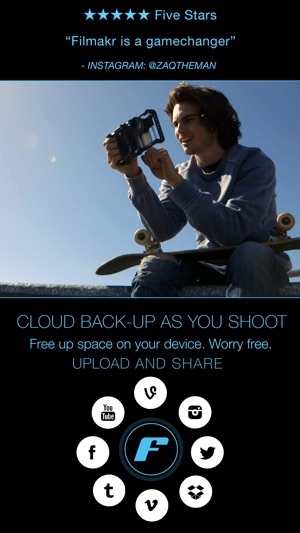 Effortless auto-sync all your film footage via WiFi to cloud. Access all 80+ & log filters. Create custom filters using Photoshop. Control vignette, grain & light leaks. Make your videos with one tap! 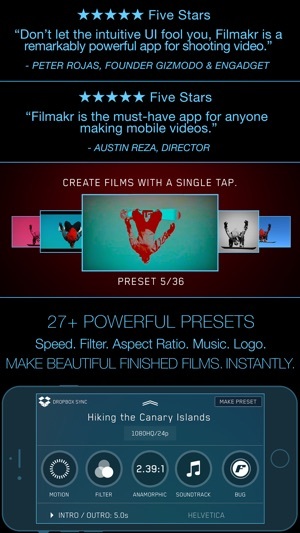 ** IMPORTANT NOTE ** This FREE DOWNLOAD of Filmakr HAS A WATERMARK so that you can test out the app. Kinda like a FREE TRIAL. When you do download the app for FREE, you can REMOVE THE WATERMARK with in-app purchase of the Manual Camera subscription at a LOW LOW PRICE!! For an EVEN BETTER DEAL buy the Camera/Editor subscription in-app purchase and SAVE MONEY. This is THE BEST DEAL for removing the watermark and unlocking both the camera & editor features. Want all the power Filmakr has to offer? Then subscribe to Filmakr Premium for Business. Well, what are you waiting for? As they say on set "Camera's up!" - Lotsa crash 'n' bug fixin' Happy New Year! - Improved In-App Purchase screen to clarify pricing and features for all subscriptions. - Support for iPhone 7+ Wide & Telephoto lens switching. 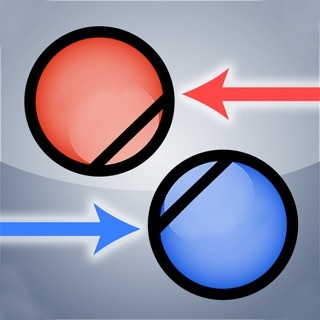 By far the easiest and most powerful of any app. - Fixing problems with importing music into your timeline. - Fixing database problem where users with lots of films and videos could not launch the app. - Big bug fix. De-crashization and bug squashifying. Mucho mas stability! - Think it's important to MAKE your films? We do too. That's why we fixed a bug messing with the MAKE function. Phew. - Fixed image scaling on B-roll and Picture-In-Picture. DID YOU KNOW FILMAKR DOES PICTURE-IN-PICTURE? Well it does! - Don't want your Fast-Motion or Strobe-Motion clips flipped upside down? Neither do we. FIXED! - Clip in Filmstrip that is over an hour now displays the hour digit. Keep makin' those films as long as you like! - Fixed Free Space calculations of working copy films. Now you know for sure how much space you have remaining! - Audio fades were not applying, now they are! - All-new render engine to apply filters to your footage and films. Zippy with beautiful results. To our fantastic Filmakrs, WE LOVE YOU! And a big thank you. KEEP THAT FEEDBACK COMING. 3) Steps that made the crash happen. If you love us, rate us 5 Stars! Bug fix for rending footage with filter. Again, pro - nounce - it Filmmaker. Two thumbs up for you! 10$ monthly to use video recording app? Are you crazy? If I am professional I will use professional equipment not an iPhone. If I’m iPhone user and want to shoot a good quilts video I don’t need 10$ subscriptions. It’s not fitness app. I bought this app maybe 1 year or so. Since I got my new iPhone X cant use it because it says restore your purchases but asks me to put my email address and all kind of crap. Please why I paid 10$ and should go thought this process. Plus now it says subscribe? Every other app just click a button and restore your purchases. So I don’t have any info about my account because when I bought it didn’t ask me any info. Developer make users life easier. It’s video recording app not a messaging to put my info here in preset purchase full version. I want to see: you open the app choose which mode you want to shoot and go ahead and shoot it. Not going hundreds of settings in order to figure out what do I needy to do. I understand it’s not point and shoot app but even complex apps needs to be easy to use. Thanks! 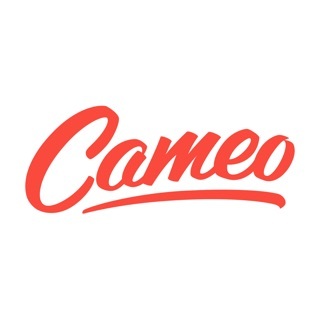 Absolutely Amazing Film Making App! 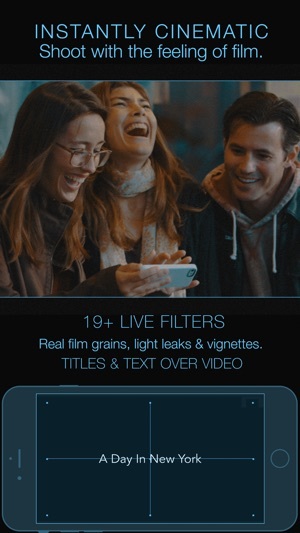 If you are interested in making or editing film then downloading Filmakr and discovering all of its amazing capabilities is an absolute must! The app features a variety of amazing features, including slow motion video and an awesome manual focus feature. I am new to the area of film making, but this app makes it fun to create and smooth to export your finished work. If you are experienced in the areas of video, music, and film or are just beginning, I urge you to download the best video editor out there in this app and get busy making some movies! Download today and let your creative juices flow! This in an All-in-one miracle video-making app. 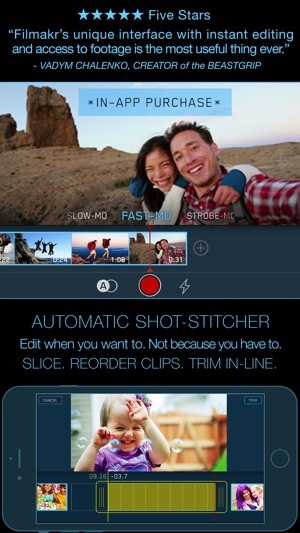 This amazing because you shoot, edit and upload all from one app. You don’t need to export any footage and import it into another app etc. Simply amazing. Try that workflow and you’ll see. You shoot directly into a timeline and can easily switch back and forth between shooting and editing. You can switch the front and back cameras as you shoot so they are edited together. This is worth every penny. There are tons of features. More than any other video app all in one app.